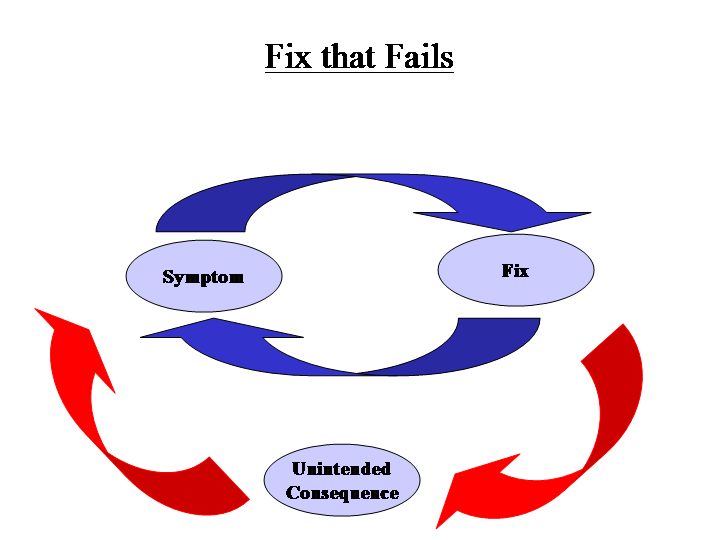 A common pattern in human behavior is to recognize a symptom and try to fix it, only to find out that the “fix” causes another problem. For example, a medicine may cure a disease but poison the patient. The overthrow of a dictator may provoke chaos. Fixes that fail occur endlessly in human affairs. rather than the underlying cause. For example, skin surgery may cure a sore but leave underlying cancer that has spread to internal organs. The fix worked, but the patient died. The overthrow of a dictator may reveal ethnic hatred based on competition for scarce resources. The two above situations are both represented by the standard system dynamics archetype, Fixes that Fail. This can be confusing since the distinction between a fix that only addresses a superficial symptom, leaving the real problem unaddressed, and a fix that provokes an entirely new problem. Sometimes a "fix" creates precisely the feared outcome. that turns out to cause that feared outcome. 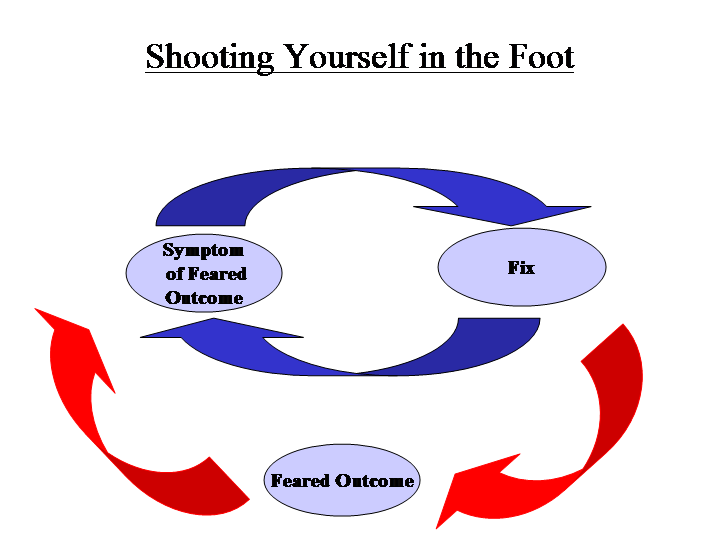 The distinction of “Shooting Yourself in the Foot” is easier to see if the standard labels of “Fix that Fails” are altered as shown in the “Shooting Yourself in the Foot” diagram. This theoretical dynamic has been applied to an analysis of U.S.-Iranian relations, where complications are explored. The theoretical danger is that what appears to be a simple dynamic rapidly becomes complicated by other dynamics that can lead to exponentially rising pressure. Failure to think through the details can easily undermine what may appear on the surface to be a rational policy.